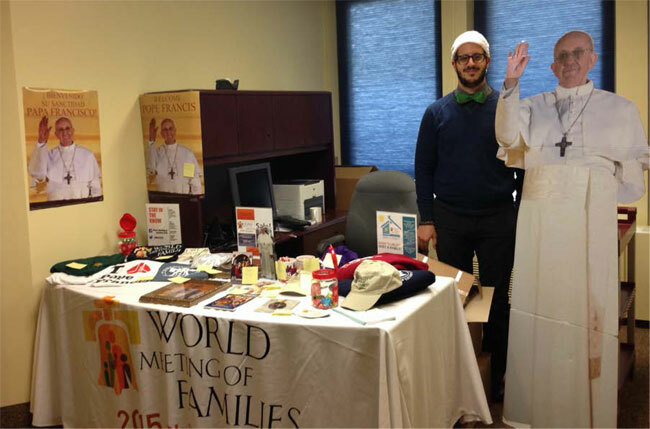 Matt Davis, a staff intern with the 2015 World Meeting of Families organization, shows some of the many items available for purchase at the WorldMeeting2015.org website -- with the support of the congress' special visitor, Pope Francis. With Christmas only little more than a week away, the World Meeting of Families is making items available for last-minute shopping on their website, WorldMeeting2015.org. The organization for the families’ congress in Philadelphia next Sept. 22-25 wants to make sure everyone gets their World Meeting of Families gifts on time. For people using standard shipping, organizers suggest ordering gifts no later than Thursday, Dec. 18 to get the gifts by Christmas Eve and no later than Monday, Dec. 22 if using express shipping. The World Meeting of Families is offering a sale this week of 20 percent off the price of sweatshirts with the congress logo — browse all the items for sale in nine categories, from apparel to jewelry to items for the home or office. “It’s exciting that at this early stage we have so many different items to choose from,” Pando said. The shipping options allow families to order the popular World Meeting of Families Christmas ornament and have it on their tree in time for Christmas morning.